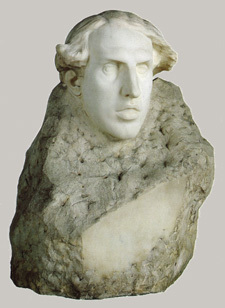 There are two versions of this portrait of composer Jaume Pahissa: this one, in which the head emerges from a half-carved block of marble, and a second bronze one that spotlights the figure's face, which is also housed in the museum. Marès participated with the former in several official art shows, most notably the 1918 Barcelona Art Exhibition. This marked Marès' official presentation to the city as an artist, and he won the prize granted by the Royal Artistic Circle. The portrait, which was carved from life, shows the influence of the output of sculptor Auguste Rodin, mainly through the use of the resource of the modelled face which emerges from rough marble, which was popularised by manyModernistes artists, as well as by the treatment of the facial features and the hair. Nonetheless, it in no way exudes the intense expressivity of the portraits by this French sculptor. Rather, Marès' way of presenting the personage shows a clearly idealistic vein that distances him from Rodin and his sphere of influence.